Don't let being a zombie ruin your afterlife! 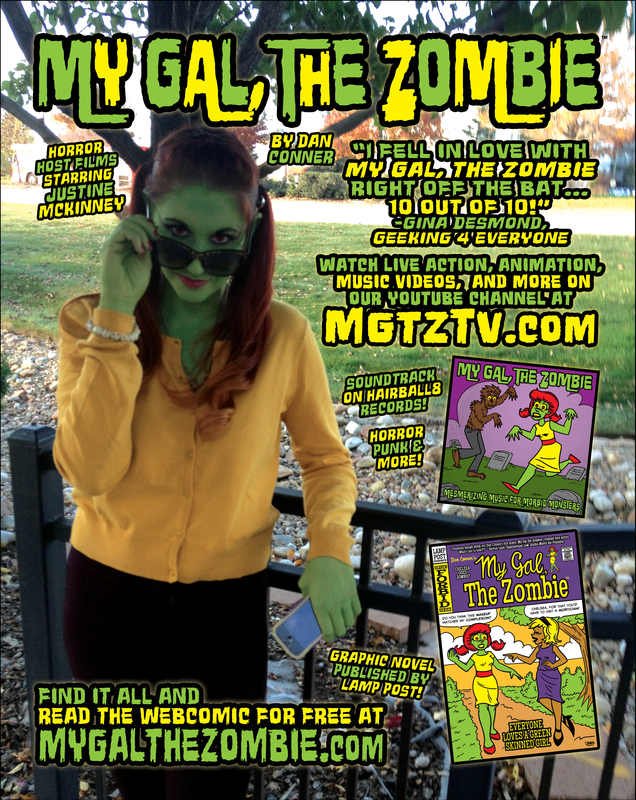 My Gal, the Zombie now on POP Comics! My Gal, the Zombie is now being serialized with POP Comics! They have an amazing interface for reading comics, so make sure to download their app! Make sure to subscribe, like, share, and comment. Search for our title in the POP Comics app, or try the link below! Zombie Gal: Halloween Happening! Free Comic Download! New Cartoon Episode! And also watch our new episode on YouTube! Free Valentine’s Day Comic Download! We’re so excited about our new Valentine’s issue! Written by Patricia Krmpotich and illustrated by Dan Conner, we think you’ll love it! You can download it by clicking this text or the cover image below! It’s free! Happy Valentine’s Day! Full Color Hurts and Kisses comic book and comic cartoons! Download the full color My Gal, the Zombie Hurts and Kisses sampler! Watch our comic cartoons of both stories as well! We are very proud to say that the production of our DVDs of our first season are complete! They have been sent out to our Kickstarter backers first and will be available to order soon! Oh My Graveness, Gals and Ghouls! We just launched our new My Gal, the Zombie: Hurts and Kisses Kickstarter! Back it at www.mgtz.co Ends May 21 at midnight! Receive your copy of Season 1 and support Season 2! Lots of interesting rewards! Welcome to our new website! It displays all our MGTZ resources in an easily navigated way! My Gal, the Zombie ©2015 Dan Conner. Justine McKinney's likeness is ©2015 Justine McKinney. All artwork by Dan Conner, except where otherwise noted.